Vegetables are a necessary component of any healthy diet. They provide essential nutrients including vitamin A, C and E, dietary fiber, folic acid, magnesium and potassium. 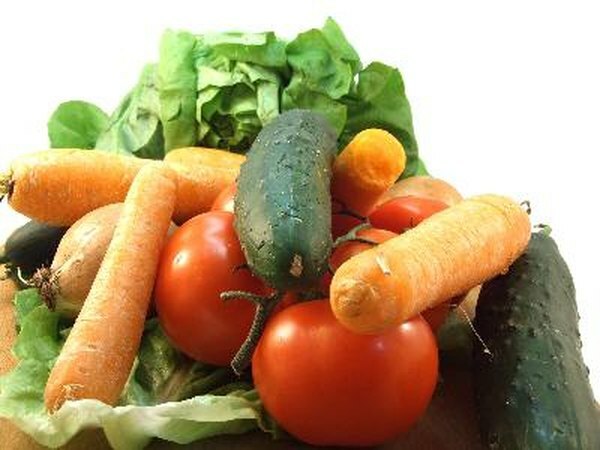 Vegetables are also low in calories and fat and contain no cholesterol. Eating a diet rich in vegetables can help you maintain a healthy weight and protect you from chronic disease. While all vegetables are healthy, some provide more nutrients and health benefits than others. A well-balanced diet should therefore include a rainbow of vegetables. Dark green leafy vegetables are rich in iron, dietary fiber, calcium, vitamins B, E and K, protein, carotenoids and other antioxidants. Examples include spinach, asparagus, kale, chard, collard greens and lettuce. Add color to your diet and meet your recommended dietary intake of vegetables by eating plenty of dark leafy greens. These vegetables are best eaten raw as in salad, with dip or as a condiment on sandwiches. They are also good lightly steamed or eaten in soups. Broccoli, cauliflower, green or red cabbage, Brussels sprouts, bok choy, arugula, mustard greens, artichoke and collard greens are all members of the calciferous family. Calciferous vegetables have sulfur-containing compounds, sulforaplane, that make them pungent and bitter. This compound has potential carcinogen-fighting effects within the body. These vegetables are rich in vitamin C and K, potassium, folic acid, iron, calcium and phytochemicals. Eat calciferous vegetables raw, lightly steamed or stir-fried. Sweet potatoes and yams are best when baked and eaten plain without added butter. They can also be added to stir-fries, casseroles or soups. Rich in carotenoids, vitamin A, B and C, potassium, iron and dietary fiber, sweet potatoes will help you feel full for an extended period. Bell peppers are available in colors such as green, red, orange, purple and yellow, each with its own unique flavor. Bell peppers are an excellent source of magnesium, potassium, dietary fiber, manganese, and vitamin A, B, C and K. One cup of chopped red pepper contains more than three times the recommended dietary allowance for vitamin C. Add peppers to any salad or stir-fry. Beans and peas are especially rich in protein. Whether eaten dried, canned or raw, they are also a good source of dietary fiber, calcium, iron, folic acid, magnesium and potassium. Examples include lima beans, peas, kidney beans, soybeans, lentils, garbanzo beans and other legumes. Eat raw or lightly steam. Add to salads, stir-fries, soups, chili or pasta sauce. Pumpkin, a low-calorie vegetable, is high in fiber and vitamin A. It helps boost your immune system while providing you with lasting energy. Pumpkin seeds are packed with magnesium. Try them roasted or sprinkled on salad. Squash comes in varied shapes, colors and flavors. Both summer and winter squash are rich in carotenoids, vitamin A and C, magnesium, dietary fiber and potassium. They can be cooked and served along or incorporated into soups and other dishes. Allium vegetables are a group of pungent and flavorful vegetables. Vegetables in this family include garlic, onion, leeks, shallots, chives and scallions and are known for their antibiotic properties. Consuming these vegetables, especially when raw, can boost the immune system, reduce inflammation and fight infection. Allium vegetables are most often used in cooking to add and extract flavor from food. Rich in beta-carotene, potassium, dietary fiber, folic acid, magnesium, vitamin A, B, C and K, carrots are bright in color and sweet in taste. Carrots contain high levels of carotenoids and vitamin A, which will help keep your eyes and skin healthy and protect against infection. Carrots can make a healthy raw snack or be grated and added to a salad.